When a parent shows up in the office of Maxfield Elementary School Principal Ryan Vernosh without a place for their family to sleep that night, it’s a struggle to find solutions – even temporary ones. Too few emergency shelters can take families, and waiting lists are long. Child care can be hard to find or access, and parents’ work shifts seldom line up exactly with the school day. Emergency funds for short-term hotel stays are rapidly depleted and parents can risk losing their jobs if they take the time off to sort out a housing crisis, Vernosh told the House Housing Finance and Policy Division Wednesday. Worst of all, these stories aren’t even rare at the St. Paul school, Vernosh said. Between 25 and 30 percent of its students experience homelessness at some point each year. Just this month, Maxfield Elementary has received at least 10 more referrals for children who have become homeless. But a scarcity of stable and affordable housing extends throughout the state, impacting thousands of families in both rural and urban areas. More than a quarter of Minnesota households spend more than 30 percent of their income on housing, according to Homes for All, a statewide coalition of more than 200 organizations working to make sure all Minnesotans have safe and secure housing. 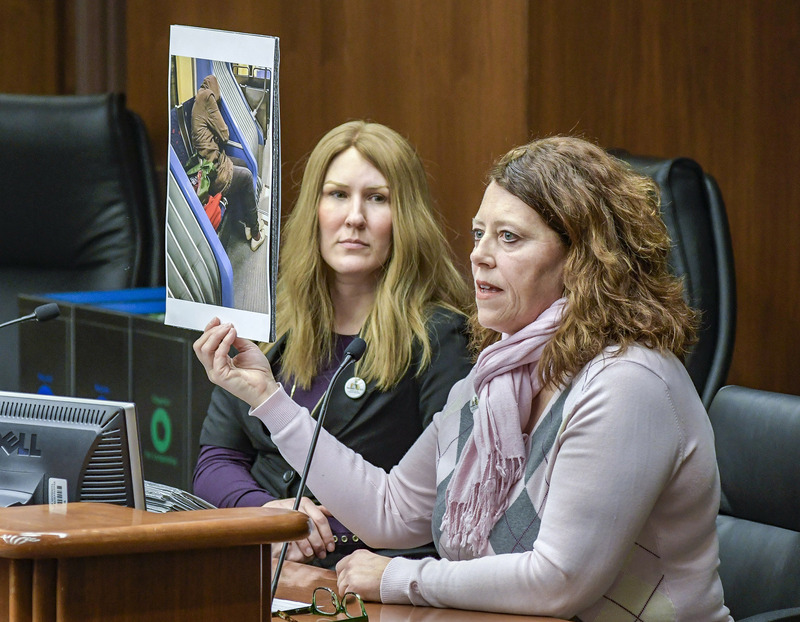 “Something that might be an inconvenience for me or for you could immediately lead to a housing crisis,” for these “cost burdened” renters and homeowners, said Senta Leff, Homes for All co-chair and executive director of the Minnesota Coalition for the Homeless. According to the Minnesota Housing Partnership, 67 percent of households that earn $25,750 or less per year spend more than half of their income on housing, leaving them “severely cost-burdened.” Of the 125,094 households that earn between $25,751 and $42,900 per year, 30 percent spend at least half of their income on housing. Even in households that earn 61 to 80 percent of the area’s median income ($51,481 to $65,700), 35 percent are cost burdened and 6 percent are severely cost burdened, according to the Minnesota Housing Partnership’s report. “Housing security, housing instability – it’s not a character flaw, it’s a math problem,” Leff said. So many other issues hinge on whether someone has access to secure, affordable housing, including education, access to jobs, and the wellbeing of seniors, Division Chair Rep. Alice Hausman (DFL-St. Paul) said. Addressing housing instability could help address inequities between white Minnesotans and Minnesotans of color, as people of color are more likely to experience housing instability and struggle to access housing and community supports, said Allison Streich, deputy director of the Carver County Community Development Agency and Homes for All co-chair. “The color of your skin is a greater indicator of your housing stability than the amount of money that you earn,” Leff said. Differences extend to home ownership, as white home ownership rates are around 73 percent while that rate is 57 percent for Asian-Americans, 50 percent for Native Americans, 41 percent among the Hispanic population, and 22 percent for African-Americans, Streich said. Although the problem is daunting, testifiers are optimistic that state investments could make a major impact across the entire housing continuum, including homelessness prevention, affordable rentals and support for first-time homebuyers. Minnesota’s housing situation is not as dire as in some other metropolitan areas, including Portland, Seattle, Denver, and San Francisco, said Jeff Washburne, executive director of the City of Lakes Community Land Trust. The problem is too large to have a single solution, and multiple approaches will be needed. They range from funding solutions, to a reexamination of coding, to innovations in home construction, said Buffy Beranek, deputy executive director of the Southeast Minnesota Multi-County Housing and Redevelopment Authority. Testifiers encouraged the division to support legislation that will help address some of the problems highlighted by The Governor’s Task Force on Housing. local housing trust funds, to help communities across the state leverage other resources to find creative solutions to their specific housing problems. Hausman said the division would likely hear bills addressing some of the coalition’s concerns later this session.